another quality meme brought to you by Eat the Book! Every morning starts off with the exact same thing to drink: my Zija! What in the world is Zija, you ask? See that beautiful orange package that says XM+? It's what I call liquid goodness: jam packed with nutrients, natural energy, and a daily requirement for me! I mix it in with about 16 ounces of water, shake it up, drink and enjoy! I also had to read a bit of UnWholly this morning even though I was running late. (I'm always running late!) This book is sooooooooooo good! Neal Shusterman amazes me with his creativity. 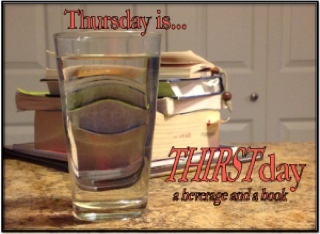 It's going to be a great Thursday THIRSTday! I have a students reading that series. I'm going to try to convince her to read CHAOS trill next. Is XM+ a breakfast replacement? Are you convinced it really works? No, not a meal replacement -- just a nutrient drink. Check out www.drinklifein.com I still eat a small breakfast (usually my Refrigerator Oatmeal at school!) Am I convinced it really works? Absolutely. Love it for all it does for my runner's aches and pains.